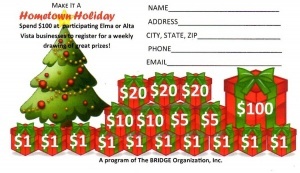 BRIDGE Bucks is a promotion of Elma's Shop Local campaign, which started in 2010. Shoppers can purchase these gift checks in any amount up to $100 each at Peoples Savings Bank. Recipients use the checks at any Elma area participating business (40 businesses currently and growing!) Businesses endorse and deposit the checks with their daily deposits where ever they might do their banking. Everyone wins; the person buying and using BRIDGE Bucks support the local economy, the businesses gain more sales making them thrive in the area! Keep BRIDGE Bucks in mind for birthdays, anniversaries, Holidays, employee incentives, stocking-stuffers, thank-you gifts, raffle prizes, or door prizes! The 2018 Holiday Punch Card Program rolled out on November 1st and run through December 28th with $25 in BRIDGE Bucks being awarded each Friday through December 21st and a Grand Prize drawing held on December 28th. Grand prize for 2018 is a $200 gift certificate from Don's Tire & Repair Service. Details were in the Alta Vista Shopper the week of November 1st as well as available by the link below.